Lantau Island, Hong Kong International Airport. 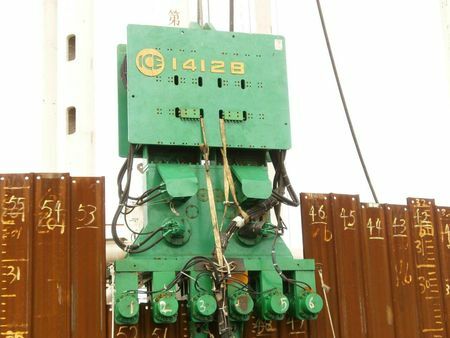 ICE Vibratory Hammers were used to drive a total of 136, 32m diameter cofferdams for the Hong Kong man made island of the Hong Kong-Zhuhai-Macau Bridge project. Its Location is offshore next to the Hong Kong International Airport, just north of Lantau Island. 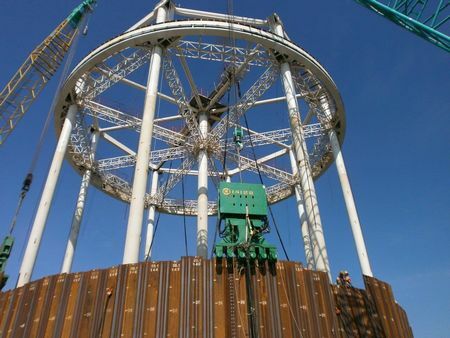 Each is constructed by 196 pieces of flat web sheet piles. 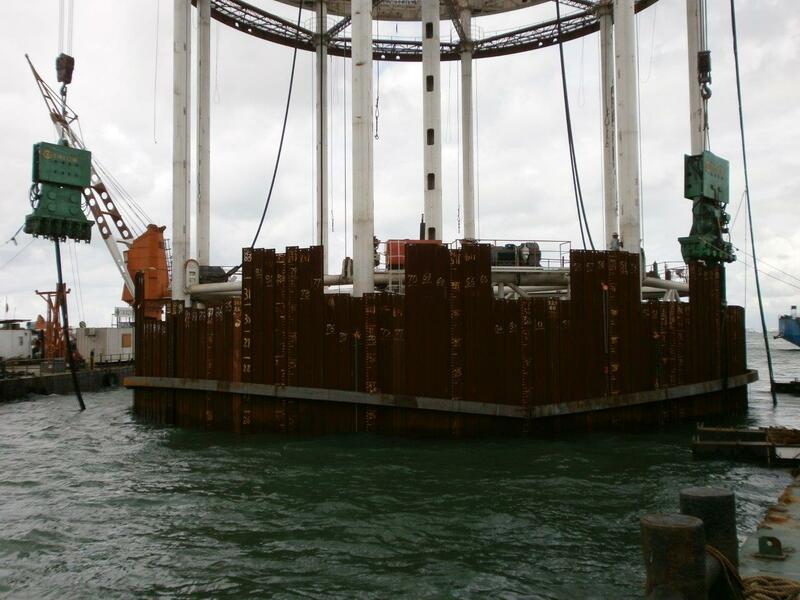 The cofferdams will form a permanent outer wall as a boundary of the man made island, so they won't be extracted as the cofferdams will be filled by gravel. ICE Vibratory Hammers in use are: 20 total including; 3 sets of ICE 110C; 6 sets of ICE 1412B; 1 set of an ICE 66C; 6 sets of ICE 28/32B and 4 sets of ICE 416L. Doing at least 95% of the workload, ICE hammers have a dominant position in the project with unmatchable efficiency, performance, simplicity, and reliability, ICE Vibratory hammers are the true working horses for this project. ICE Clamps on this project include: 58 units of ICE 140C clamps and 10 units of ICE 142BH clamps. ICE setup standout advantage: Each set of 6x140C clamps mounted under the hammer by a simple one-pc, precisely machined from the highest strength forged steel. This design saves critical weight and height when the crane height is strictly limited under the flight path. 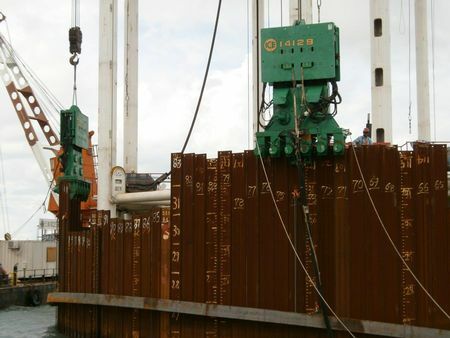 The 280cm length of the ICE setups allows passage between the sheets when driving the 6-sheet pile groups (300cm total width), while others can't. 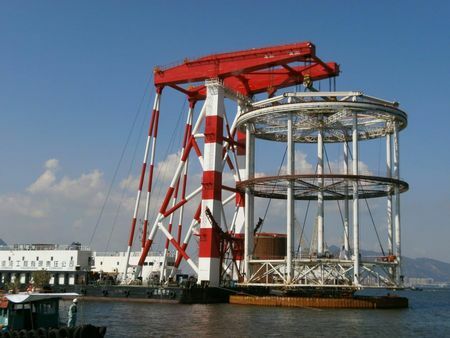 The Contractor of this project is the China Harbor of Hong Kong. 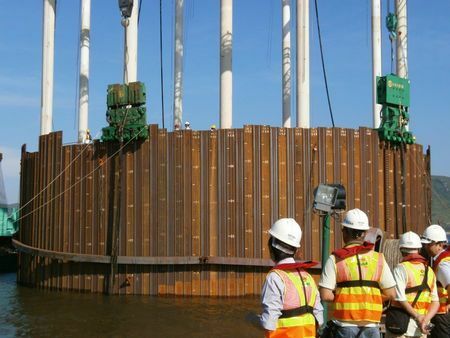 It takes about a week to install each coffer dam, the project is expected to take about a year to complete.